Bricklaying apprentice Chicane Eaton, 16, had hopes of a career within the Armed Forces. However, this was put on hold. 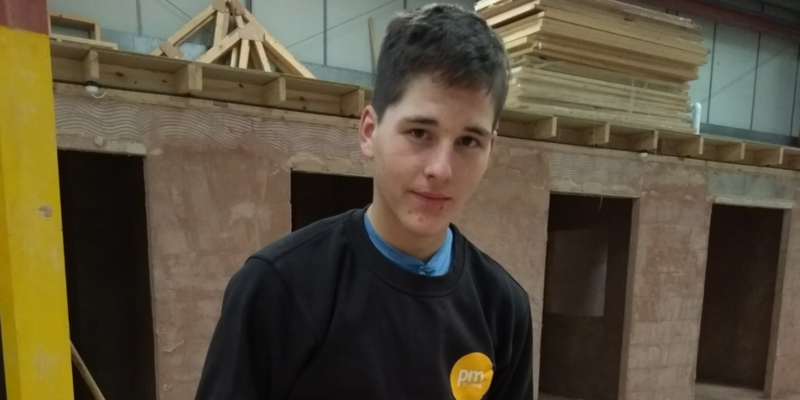 Not letting that stop him, he looked into other career opportunities with PM Training to gain hands-on skills to be able to progress his career in a trade. Bricklaying wasn't on the cards initially. But after starting with PM Training he soon got to know the staff and the programme. He was sold and within three weeks of joining, had earned an apprenticeship placement with local firm SS Buildings. Are you glad you joined PM Training? Definitely. It's done me the world of good! I have manged to get an apprenticeship within 3 weeks of joining PM Training. I couldn't believe how fast it was. The staff have been really good and it doesn't feel like a college or a school environment. Everyone is really laid back and they let you get on with it and I really like that, they treat you more like an adult. Do you think apprenticeships are a good choice when finishing school? I do think there is a big stigma attached to apprenticeships. It's important that young people realise how good they are and the great opportunities that come with it. Even I initially thought that apprenticeships probably were not for me before I started. I would recommend them to anyone. They are the best choice when finishing school if you want to earn money and do something hands-on! I will hopefully get the opportunity to apply again for the Armed Forces. I know the skills and experience I am getting here at PM Training will help me, and I'll be able to get into an area of of the Army where they can be put to good use! What would you say to young people leaving school? I would say really consider an apprenticeship. Come and find out for yourself. I'm really glad I did it and it's completely different to a school environment. PM Training is a brilliant place to come as everyone is so laid back and friendly. It's so different to school. You get to work with your hands and earn a wage which really helps! Apprenticeships are a fantastic way of building up the skills and knowledge you need to progress your career. From job sectors including: gas & engineering, bricklaying, construction, fenestration, joinery and more. Apply now or attend one of our Open Days to find out more.